Ken Anderson grew up in the rough-and-tumble world of motocross in the United States and ended up working with the Fox Racing Shox company in California, designing shock absorbers. A friend from motocross days was Roger Mears, Rick Mears's brother and when Roger tried his hand at Indycar racing in 1982 he asked Anderson to design some shock absorbers for him and through Mears he met team boss Roger Penske. In 1984 Penske hired him to work for his CART team. In the years that followed he designed Penske shock absorbers and established Penske Racing Shocks, Inc. He was race engineer for Rick Mears between 1985 and 1988 and became the team's chief engineer. He also did suspension work for Williams as part of a deal which Penske had to use the Williams windtunnel. 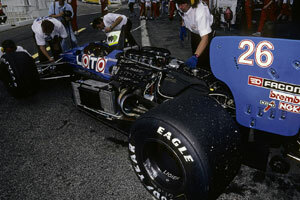 This led to Anderson being hired by Ligier in 1988 as the team's technical director. The resulting JS33 was a rather better car than its predecessor and in Canada Rene Arnoux managed to finish fifth. This led to a job for Anderson at Onyx Grand Prix Engineering, where he began working with Stefan Johansson. After the team collapsed Anderson went back to the US and became technical director of Chip Ganassi Racing, working with Eddie Cheever and Robbie Gordon. He also set up Chip Ganassi Racing Ltd. in England which would later become G Force Precision Engineering. He followed Gordon to AJ Foyt Racing in 1993 and then went to rejoin Johansson at Bettenhausen before being involved in formulating the rules for the new Indy Racing League. Working for Bradley Motorsports he then helped Buzz Calkins to win the first IRL title (which he shared with Scott Sharp). In 1996 he designed the first G Force IRL car and in 1997 the car won the Indianapolis 500 in the hands of Arie Luyendyk. He continued to engineer cars for Gordon in 1997 and 1998, while also designing an offroad truck for Toyota for Gordon to drive in Baja races. The link with Toyota led to design work with Dan Gurney's All American Racers in CART. He maintained his links with G Force and designed the 2000 IRL car for the company and when Michael Kranefuss decided to set up a chassis business in 2002 he asked Anderson to be the technical head the Falcon company. That project was, however, short-lived and in 2003 Anderson moved to NASCAR as technical director of Haas CNC Racing. In 2008 he re-emerged as the head of a planned USF1 team.